Note to Mortuary contributors: please consider that your boss may not find your submission in the best interests of your Big Company. Once in a while we get a "please remove my submission" email, try not to send us anything that you might regret. Note to Big Companies: Don't blame us for posting your spectacular failures, we only post what your employees send us. On the other hand, please don't rip off Microwaves101 pictures for presentations without permission, that's bad manners. Maybe it's time for some training! Note to Mortuary fans: In many cases, if you click on pictures on this page you can see higher resolution images. October 2018: This picture came in from Dave, and we admit, it took us a minute to find the problem. Look closely - can you see where they went wrong? September 2018: From "Anonymous", this is a photo of the clean room at an unnamed facility...ick. Here's a submission from David, who received this from a customer for calibration. We aren't sure calibrating will fix that needle! New for May 2018: From Tom. 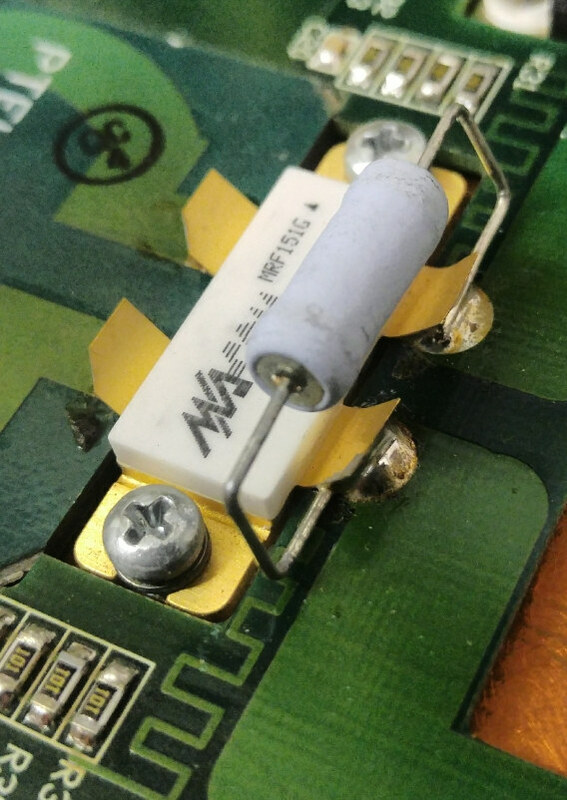 Why is it soldered this way? 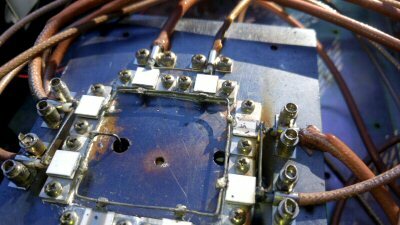 New for April 2018: This came from Dave, title is "Coax Dielectric Loss". Located problem at approximately 263 feet...opened the line 9 sections up from the base of the tower and confirmed that this was the location of the failure. 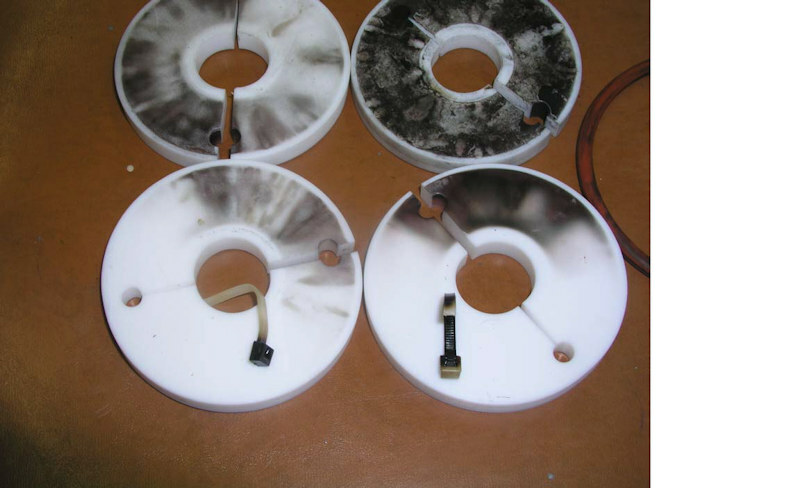 It was necessary to clean six transmission line sections above the failure due to contaminants from the burned Teflon. Nine transmission line sections below the failure were also cleaned due to the soot contaminants from the burn. During the cleaning the crew found a black and charred ty-rap inside the transmission line above the failure point. We suspect that the original failure was due to a ty-rap that has now been completely burned up. There was no damage to the inner conductor or the expansion joint and the only point of failure was a break down of the Teflon insulator. 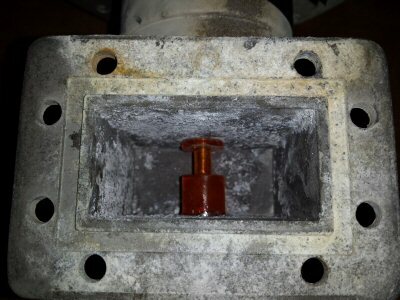 The insulator had to be contaminated with some foreign object or material in order to breakdown and burn as is in this case. 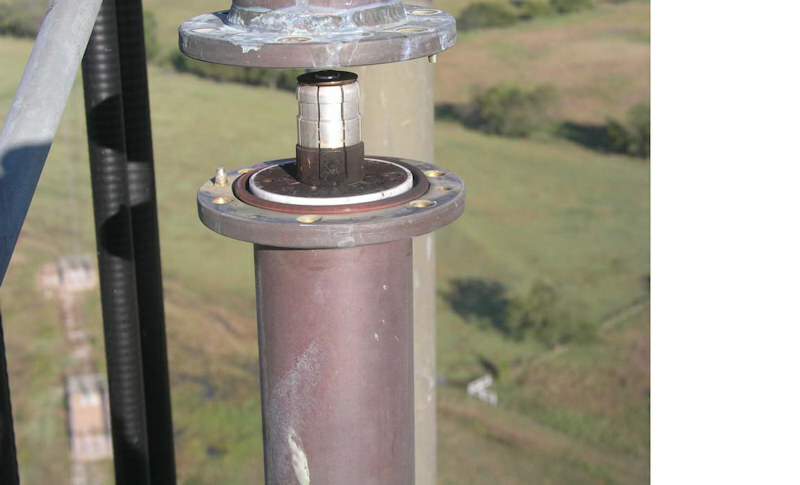 Another ty-rap was found approximately three transmission line sections below the failure point. Editor's note: just because something is white and plastic, does not mean it has excellent microwave properties like Teflon. 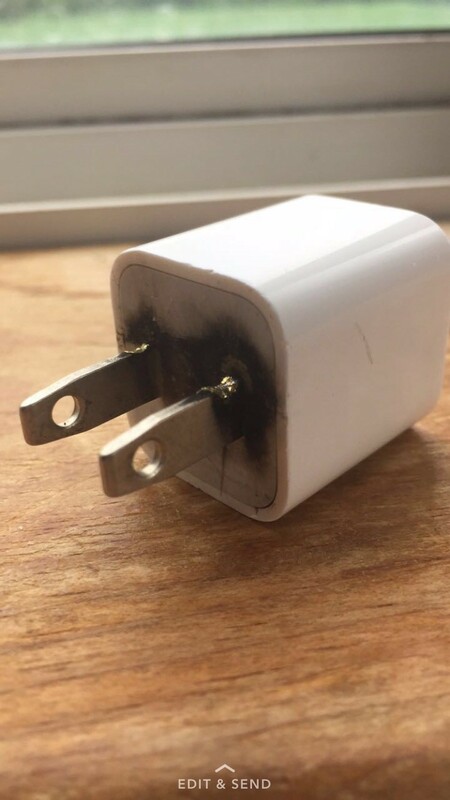 If a ty-wrap has poor loss tangent and is exposed to high electric field strength, it can heat up and eventually burn. Foreign object/debris (FOD) is a real problem in manufacturing hand and maintaining hardware. So is this Wilkinson or Wontkinson*? 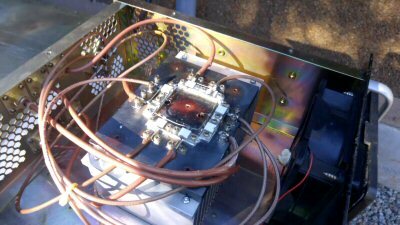 This is a 2500 watt FM broadcast band setup from a manufacturer of very poor and well deserved repute. 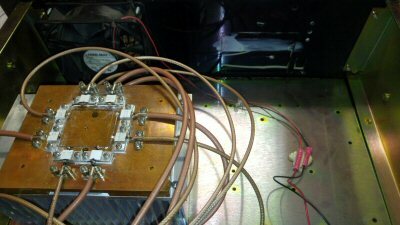 The upper unit is the exciter, which is a combined exciter and 150 watt PA unit. In normal operation it runs about 45 watts which goes to the power divider in the center unit, which divides it out at 0 degrees to each amplifier. 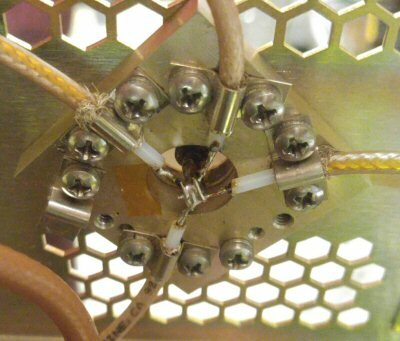 Those feed a Wilkinson combiner, which sends power to the final output. 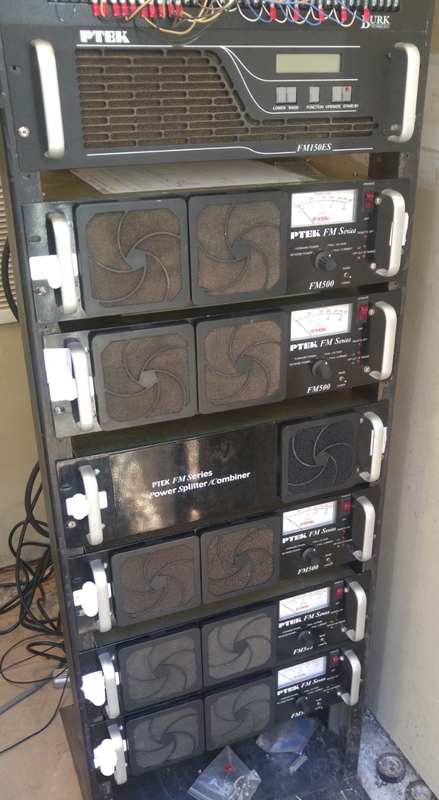 Each amplifier is 500 watts output. Remember this for later. Sounds good, right? Brace yourself. The power divider is complete poppycock. I've never seen anything like it, and it doesn't work well -- a few watts reflect back to the exciter. 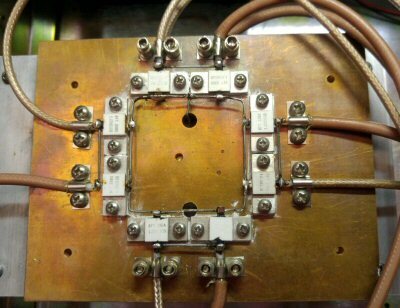 But then you hit the Wilkinson and the quarter wave transformers made of coax cable. Very very thin coax. I forget what the part number is but the center conductor is maybe 28 gauge. For 500 watts. So now, the resistors. Their purpose is to dissipate energy and provide isolation in the event of a mismatch, which shouldn't be sustained normally because the amplifier should ideally have some safety features that will trigger foldback or shutdown in the event of mismatch. The amps don't have ANY interlocks or unified power control at all, and simply switching one of the amps off with the system running will thus trigger meltdown. 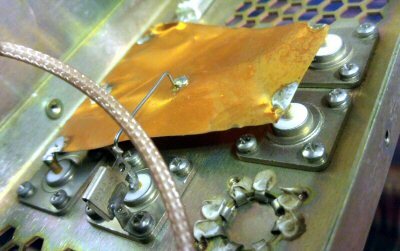 The resistors also can't handle a serious mismatch dissipating the full power of an amp. I don't know which amp(s?) went down first but I got the message the signal was "unlistenable". As I drove to the site I heard a horrible chunking noise full of 60 cycle ac growl. It sounded like the transmitter was going down a garbage disposal.... Which wouldn't be far from what actually happened. 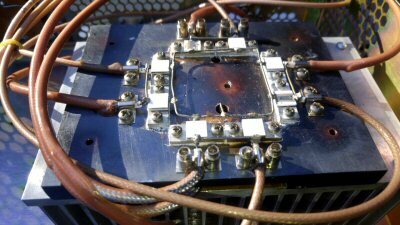 Three of the five amps seem to have blown up and the combiner is WELL DONE, it even melted the fan partially. It should be self explanatory which photos are before and after. The copper plate turned blue!! These images come from Jose. Editor's note... Jose is not alone in the GaN-blows-up-when-you-look-at-it-funny experience. 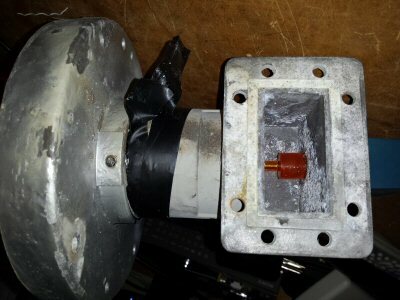 Send in your own non-ITAR/non-proprietary failure photos please! 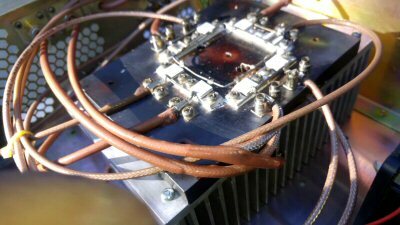 In the process of testing some GaN PAs we ended up blowing up one of them, and the blown up transistor is so magnificent that I felt compelled to share it with the world. Brief story behind it, we needed to do some measurements without using off-chip capacitors and this unstable PA ended up drawing too much current. Surprisingly it still had gain after being left with one less transistor. New fro July 2017: here is a classic needle probe crash from Robert. Thanks! 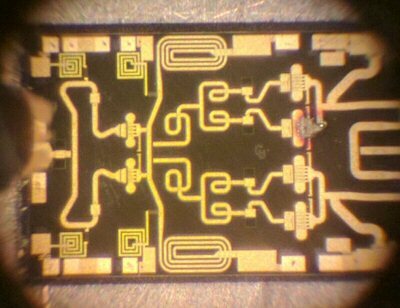 This is a DC probe, with integrated bypass capacitors used to stabilize amplifiers when they are RF rested on-wafer. Believe it or not, this type of accident can be repaired, either by a patient technician, or by returning it to the manufacturer. This cautionary tale came from Darrell. This is an Anritsu 2.92 mm airline from Ebay. The female end was stuck between the wall and center pin of the end cap (short circuit) when it arrived. It's going back for a refund. Ebay for anything with microwave connectors seems like gambling. I've sent back about 25%. Also from Tom, titled "C-band by the Sea". The original picture are very high-res, unfortunately they are too big to upload.... we'll figure it out and add them later. This C-band satellite feed horn and polarotor lived by the sea. Can you tell? Link margin and EB/N0 just gradually shrank away to Davy Jones Locker. This week I bought twenty surplus Nokia RRIC boards. When I bought them, it was very clear the warranty was void... I bought the board very cheap, primarily for salvaging the N-connectors for ham radio use. And there are some nice other components like several xtal oscillators and smd chips for practicing my smd soldering skills. I knew the condition of the board when I bought them and for the price I couldn't complain. But I wondered what happened to the board before I bought them... Are they been run over by a truck?! 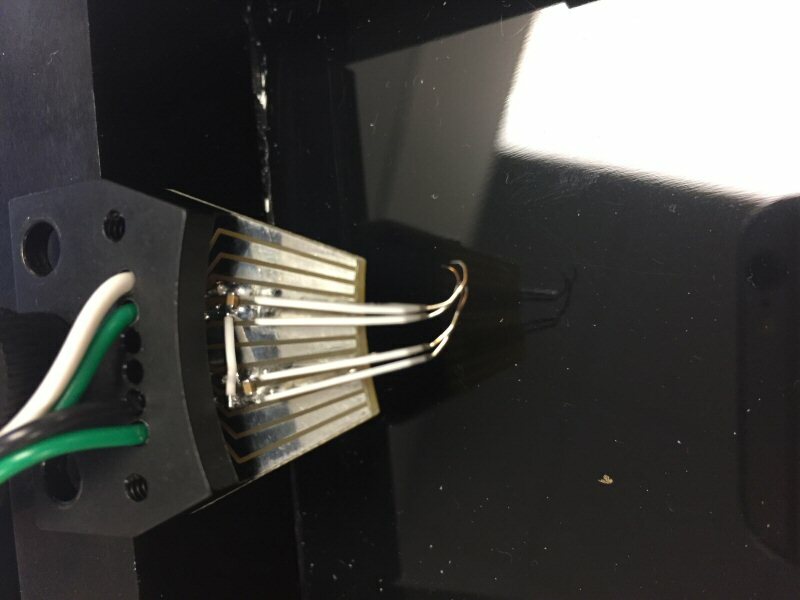 Not only parts are missing/split in half, but parts of the pcb are cracked or even missing, including half of the connector! Want more? Check out the Microwave Mortuary Archives!